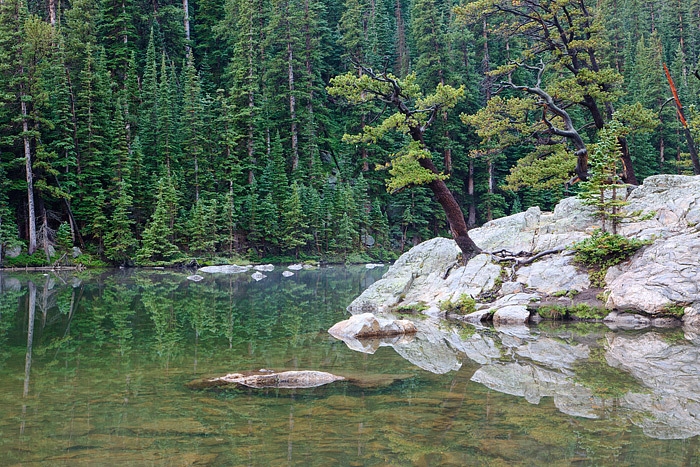 Dream Lake is host to one of Rocky Mountain National Park along with the state of Colorado's most iconic views. The classic view of Hallet Peak and Flattop Mountain from the shores of Dream Lake is only one of many intersting features found in this area of Rocky Mountain. On a rare foggy and wet morning, the Bristlecone Pine trees along the shore of Dream Lake look more like a Bonsai garden then a scene from Colorado. No wind, a moisture coating all the trees from a heavy rain the night before helped to make the emerald green colors stand out when photographing this scene. Photo © copyright by Thomas Mangan.